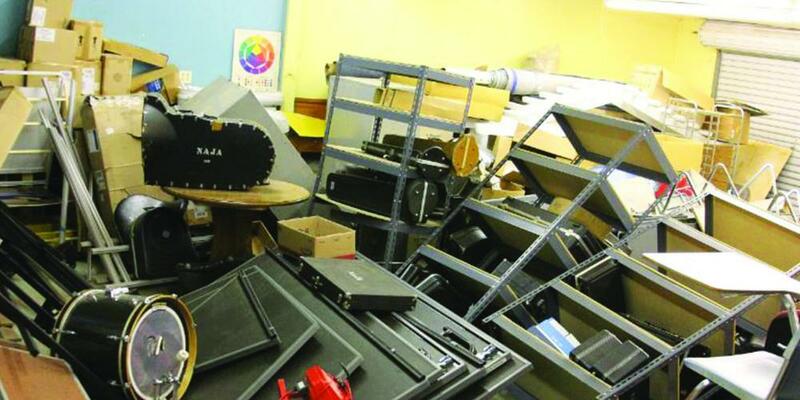 Are Our K-12 Schools Ready for The Big One? Picture this: A bookshelf packed with heavy materials located next to an exit, a large steel teacher’s desk on wheels that don’t lock sitting in the middle of a classroom, a tall filing cabinet next to student desks, folded cafeteria tables on wheels lining the walls of a gymnasium, a piano on wheels sitting in a hallway, lockers not attached to walls… Okay, now picture what happens when a 9.0 earthquake hits. 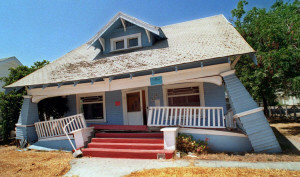 One of the questions I hear most frequently from my neighbors is: How are our schools preparing for a major earthquake? I can’t speak about private schools, but I can say that our public schools are doing the best they can with the resources they have – which is to say, not enough. Thanks to bond measures passed in 1995 and 2012, Portland Public Schools has completed seismic upgrades to many of their buildings. They also require schools to do earthquake drills twice a year, and some (but not all) schools have stockpiled emergency supplies and water. This is a good start, but it’s not enough to ensure all children’s safety during a massive earthquake. 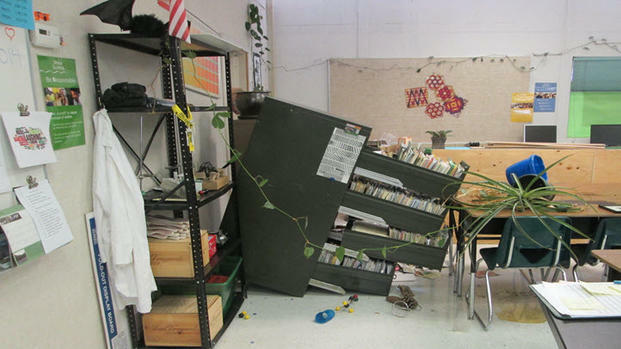 Non-structural hazard mitigation encompasses many types of preparation, but the most relevant for this conversation is the securing of a building’s contents that could become hazardous during an earthquake – like that bookshelf by the only exit of a 1st grade classroom. 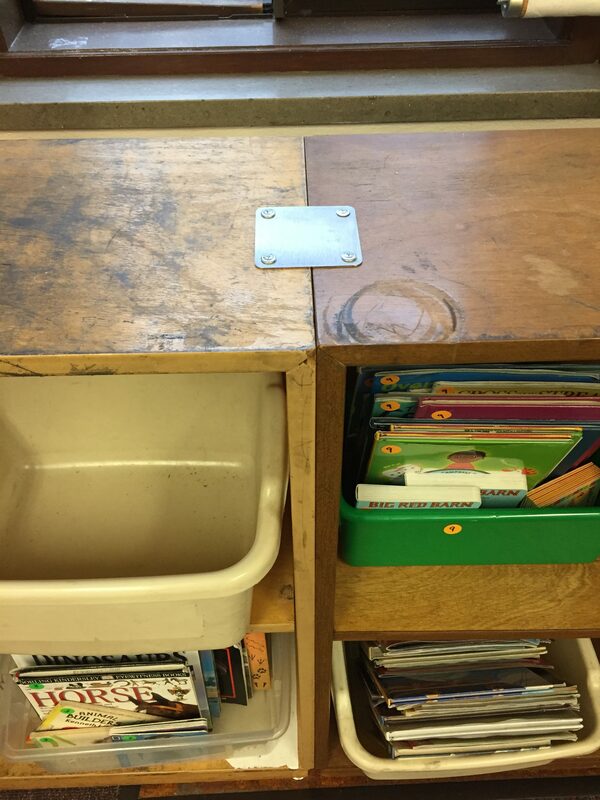 Securing that bookshelf might be one of the best and easiest ways to prevent loss of life for those 1st graders. 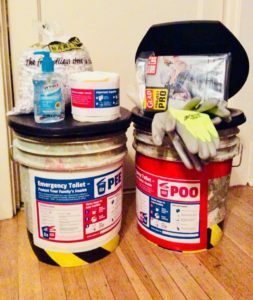 As much as the hard-working folks at PPS would like to secure all of these hazardous items, they don’t have a budget for it. And it’s not because they don’t care. It’s because they’re faced with SO MANY other urgent issues and an incredibly restrictive budget. And because by and large, people don’t voice their concerns to administrators and elected officials about this topic. Okay, political rant complete. Besides allocating more money, what can we do? Parents, teachers, and administrators are working together to find creative solutions. The group Parents4Preparedness (P4P) was formed in 2015 by a group of concerned parents. They meet every two months during the school year to advocate for sufficient earthquake preparedness resources, promote best practices, and share information to improve the resiliency of Oregon’s schools. These are parents who have had some successes (strapping furniture, leading parent/child reunification drills, etc.) who are trying to reach out to other parents to share what they’ve learned. Unfortunately, it’s not as simple as buying some brackets and “getting someone to do it.” There are liability issues to consider. There are schedules to consider. There are busy, busy teachers to consider. There are 100+ year old buildings with lead paint and weird materials in the walls to consider. And there are very serious equity issues to consider. One of P4P’s co-facilitators, Susan Romanski, is the US Director for Disaster Preparedness & Community Resilience for Mercy Corps. Now through the end of the 2016-2017 school year, Susan is offering to do 90-minute earthquake preparedness presentations and facilitated discussions for PPS schools that request it. 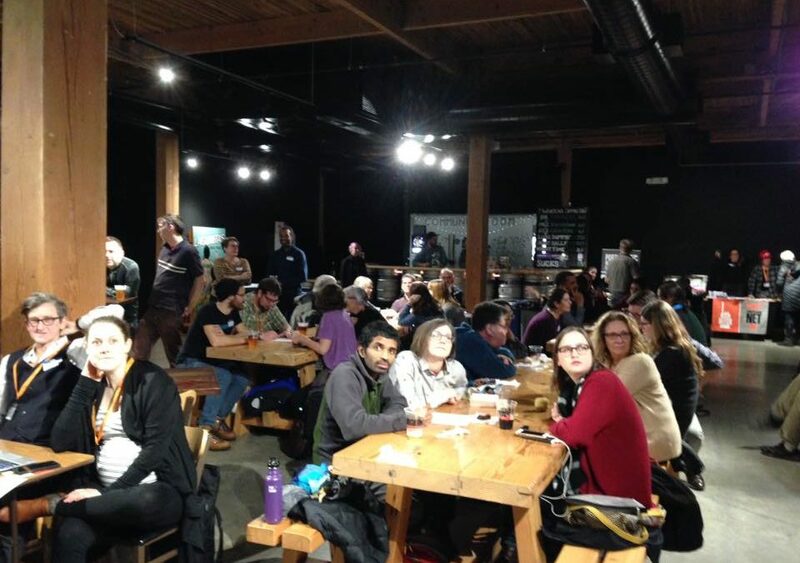 She’ll cover basic steps to prepare families, communities, and schools for a Cascadia event. Her presentations can be offered in English or Spanish. Here’s the catch – a parent (or group of parents) has to take this on. They need to organize the event, publicize it, and work with the school’s administration to make it happen. Parents interested in arranging a presentation at their school should carefully read this flyer. Neighborhood Emergency Team (NET) member participation is welcome and encouraged at these events. Once an event is scheduled, the NET Team Leader in that neighborhood will be contacted, and the TL can attend the event or find someone else on the team to do it. The NET can introduce themself, share their NET experience/activities, or simply explain what NET is. This can create a bridge between the parents and the NET. Work is currently being done on a new PPS Health, Safety, and Modernization Bond proposal for May 2017. This bond is our only hope for funds that will continue to make schools safer for the next 6-8+ years. There are no other options for capital funds in the amounts needed – not from the City of Portland, the State of Oregon, or FEMA. We must persuade our friends and neighbors that these investments in safety make sense. The first meeting with opportunity for public testimony is from 6:30-8pm on Thursday, February 2 at Madison High School. There will also be a School Board meeting on February 6 and additional town halls on February 7, 8, and 9. See the district’s bond website for details and complete this very brief online survey before February 10th. Your help is needed in getting the word out about P4P, the Mercy Corps presentations, and the 2017 bond. We especially need to make sure that parents in underrepresented communities hear about this. So please, spread this far and wide. I know parents are overwhelmed with other issues, but this is an issue that threatens thousands of children’s lives. 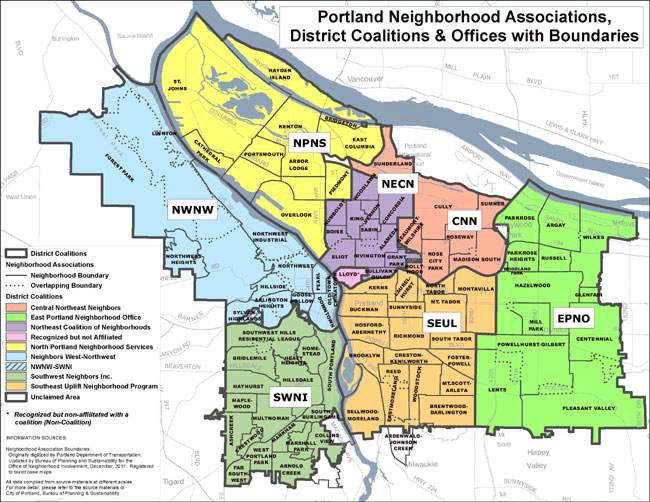 In Portland’s Sunnyside neighborhood – and in other neighborhoods – we’ve collaborated with a supportive Neighborhood Association (NA), and it has been extremely productive and mutually rewarding. We offer a summary of our experience hoping that it will be useful to other Neighborhood Emergency Teams (NETs). 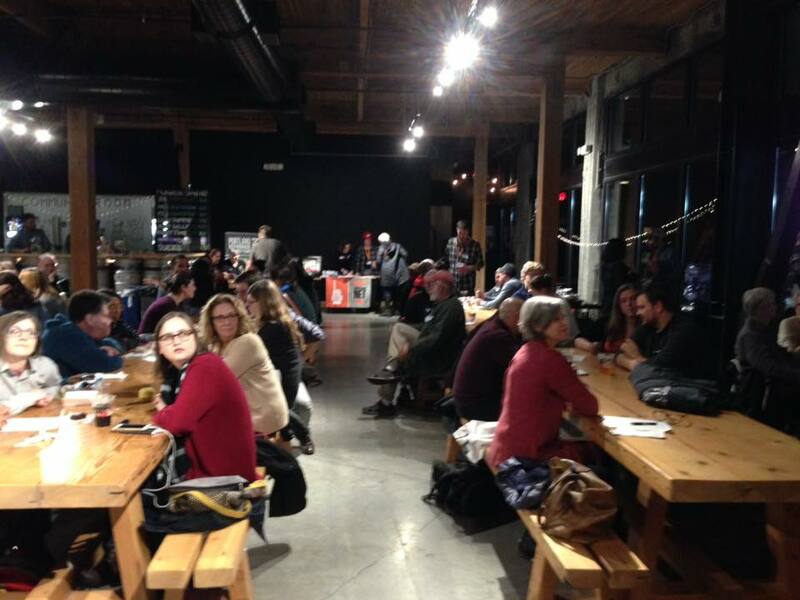 In a little over a year, more than 200 non-NET neighbors have joined our email list, and hundreds more have attended meetings or outreach events. Some do not have the time or desire to get NET Basic Training, and others are satisfied preparing “only” their block using Map Your Neighborhood. That’s fine. We want all of these people to be aware of each other and to share training resources. And we want to meet them before an emergency occurs. 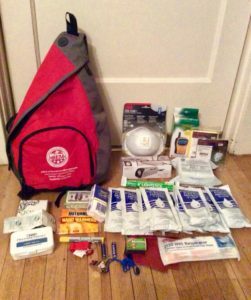 Each neighbor with an emergency kit makes for one less household you’ll need to worry about in an emergency – plus, they might be able to help as a Spontaneous Unaffiliated Volunteer (SUV) or Affiliated Trained Volunteer (ATV). We have supported several block parties/meetings where neighbors meet and create a plan for their micro-neighborhood. We are integrating with our NA’s Crime Prevention Committee, and the Office of Neighborhood Involvement’s Neighborhood Watch program. It’s a no-brainer: recruit civic-minded people wherever possible. The “Sunnyside Prepared” committee was founded to recognize the need to work with everyone in the community who is interested in preparedness, not only NETs. Sunnyside has 6,000+ residents and fewer than 20 NETs. We need all hands on deck. The committee was proposed to and approved by our Neighborhood Association, who recognize the value in supporting this work. We proposed an itemized budget, and the NA board happily approved it out of their funds. We also segment our monthly meetings into general “emergency prep” and NET portions. Everyone is welcome to attend all, unless we plan to discuss confidential information only approved for NETs. There are so many reasons to do this! Request a budget from your NA! We are aware of teams receiving $250 – $1,500 annually. Keep a keen eye on your accounting and use money strictly for its approved purposes; it is very important to keep your Friends of Portland Fire & Rescue and NA accounts and ledgers separate. And proactively report to your NA how its funding improved your outreach and performance. How many people attended events? How many brochures were distributed? Also account for in-kind costs you do not incur but which support your work, e.g. materials from PBEM. Your NA needs to understand the total return on its investment. You will reach a much wider audience through your NA’s calendar and newsletter, as well as NextDoor.com. Your NA probably gets a booth at local street fairs at no cost. Ask to use/share it. With official recognition by your NA, school administrators will be more likely to welcome your collaboration. Mention that NETs are background-checked by PBEM; of course, school staff do not allow strangers to wander school grounds. PPS has its own background check process that they may ask you to complete. As a public agency, PBEM cannot support any activity that might be perceived as endorsing a business. However NAs can, and their endorsement legitimizes your outreach to local businesses. See the PortlandPrepares.org article NET + Business Partnership = Win Win Win. We are considering a window-sticker campaign to “brand” our neighborhood businesses for emergency preparedness. 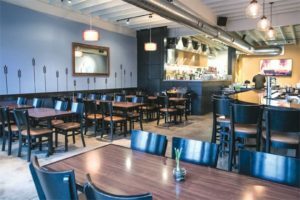 Your NA might be able to give you a page on their site at no cost (like SunnysidePrepared.com) or at least a link to your team’s page on PortlandPrepares.com. Committees of NAs may place orders through the City’s Printing & Distribution office (SW 2nd & Main), whose rates are usually better than retail. Plus, with pre-approval for each order, they bill the NA directly so you don’t need to go out-of-pocket. Once you get going, you will become one of your NA’s most productive and active committees. And that leads to more support and mutual reward. Neighborhood Association boards change. Ours is amazingly cooperative, though we’ve heard about contentious NAs in other parts of the city. Establish your committee outside the politics of other issues and be sure to report about the value you’re contributing. That should help ensure that your NA’s support will endure. 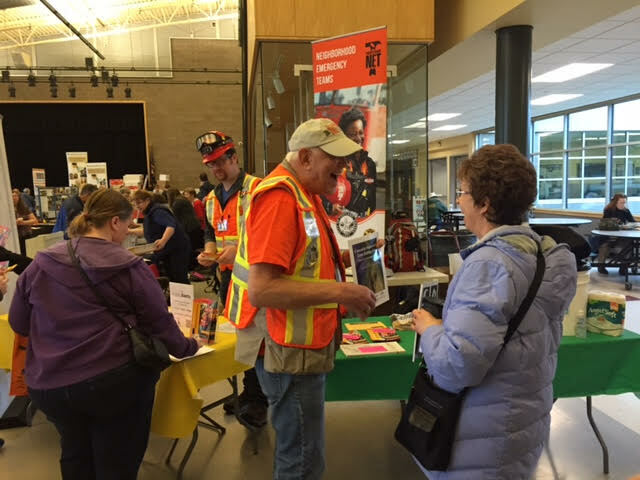 At some meetings you will be mingling trained NETs with the general public, so balance NET exercises with an increase in outreach to people just beginning their personal emergency preparedness. Consider appointing an ATL to primarily handle outreach and ensure that you don’t neglect your other TL duties. To explore this, we plan to test separating our monthly public meetings with separate quarterly NET exercises. We hope our experience will be useful to you. PLEASE, share your experiences with us. We would like to revise this piece in the future to incorporate great ideas that other teams share. How many of you live within walking distance of your friends and family? Probably not many. When the Cascadia quake hits, there will be no more internet, cell phones, or visits to friends across town. Your radius will shrink. The people in your world will be those who are actually right there near you. And there’s a good chance it will happen when you’re at home. Who will come get you out of your collapsed house? Who will know to look for your children or pets? Who will put out the fire if you are not there? Who will you band together with to share skills and supplies? From that first rescue to the procuring of water, food, and medicine, we will all likely need some help. When we trade help with those near to us, we will create new close bonds based on real human needs and personal contact. We will come to know who we can trust. People will be forced to cooperate when services and supply streams fail. While disasters will create communities out of necessity, having strong communities in place before a disaster is far more effective. So how can we build a sustainable community that looks out for its members? How can we function like a tribe, with personal accountability and respect? The tribes that we create around sports teams or musical preferences may be useless in the face of real adversity, but good relations with our close neighbors could save our lives. Many of us are not comfortable knocking on doors and introducing ourselves to neighbors. We’ve become accustomed to building social bubbles and respecting others’ bubbles to the point of not knowing the person living next door. Inviting neighbors to a Map Your Neighborhood party is a good way to break the ice. 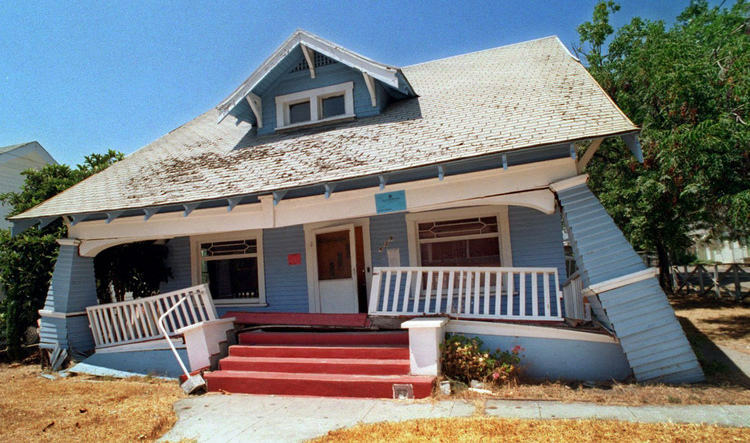 You can convene around the topic of neighborhood earthquake planning and get to know each other personally in the process. Make it a potluck – everyone loves food! 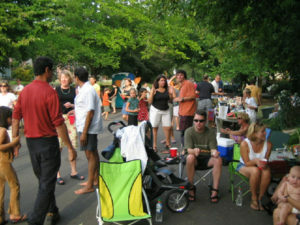 Do it in August – the City of Portland waives block-party fees in celebration of National Night Out (check out their great Game Ideas). Don’t forget to emphasize the fact that if nothing else, everyone should be stockpiling water. Social media can aid us in getting to know our neighbors. There are a number of platforms that seek to bring people together locally to convene around various topics or exchanges. Among others, NextDoor and Buy Nothing are active in Portland and worth considering. NextDoor.com seeks to build stronger and safer neighborhoods by providing a space for people to do things like: spread the word about a stolen car, organize a Neighborhood Watch Group, find a trustworthy babysitter, ask neighbors to keep an eye out for a lost dog, find a new home for an outgrown bike, or advertise a Neighborhood Emergency Team meeting. These online interactions often lead to in-person community building. Nothing can beat chatting with your neighbors on a regular basis. Make a point of waving and saying hello more. Make an opportunity to talk to the senior across the street about her garden. Make a double batch of muffins and go chat with the family next door. It behooves us to prioritize people in a face-to-face way. Our most important preparedness (and happiness) goal may be to build close-proximity relationships. Long distance doesn’t help when you’re trapped under debris. 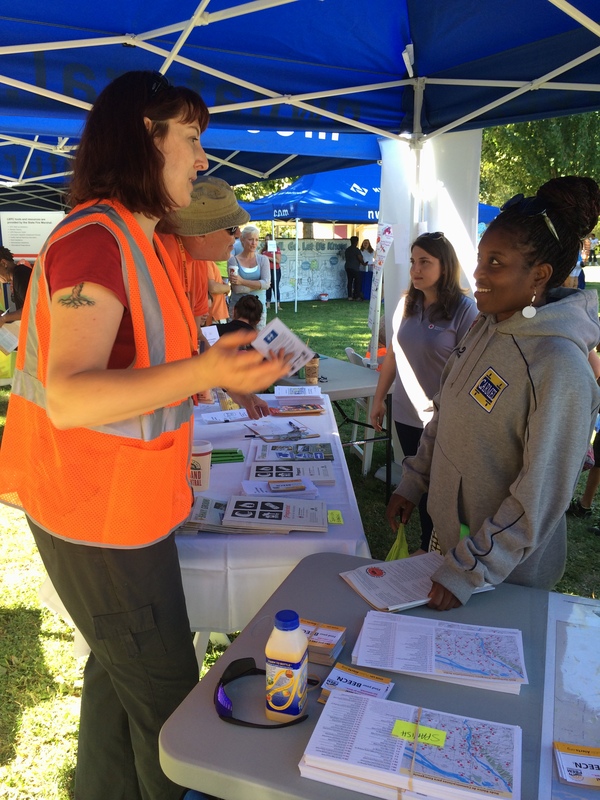 Sunday Parkways, Farmers Markets, National Night Out, Movies in the Park… It’s summer, which means it’s outreach season for Neighborhood Emergency Teams. Outreach is an incredibly important part of what NETs do. After all, we can’t help everyone, so we need to help our neighbors prepare themselves. At the last Arbor Lodge / Kenton NET meeting, one of our talented team members (Angela Watson) presented us with this great list of tips for how to interact with the public when staffing an outreach booth. 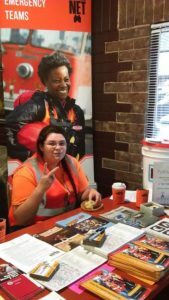 WHY VOLUNTEER TO STAFF A BOOTH? Help your community become better prepared for a disaster and more resilient. Help NET by raising awareness of what NET is, recruiting new NETs, and getting donations. Help yourself by making new connections and earning NET hours. WHAT DO I NEED TO DO AS A BOOTH VOLUNTEER? 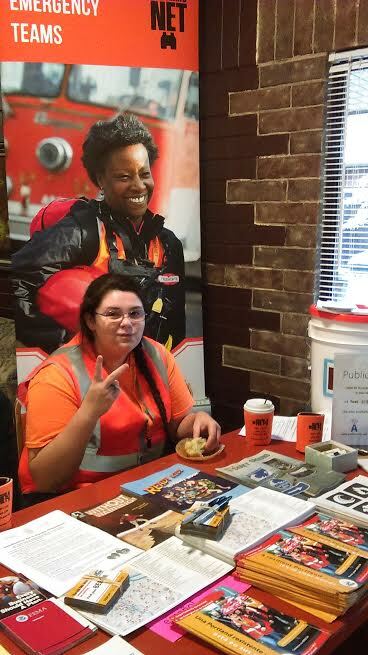 Wear your NET vest, badge, and hardhat so you’re easily recognizable as a NET member. Be there for your entire shift and ensure a good hand off to the next shift. Be visible and welcoming without being pushy. Speak positively about PBEM and the NET program. HOW DO I GET PEOPLE TO COME TO THE BOOTH, AND WHAT SHOULD I SAY? Draw people in with eye contact, body language, and simple questions. If YES: Point to Hazards Map and ask “Whereabouts?” and discuss nearby hazards. Tailor the conversation to your audience. 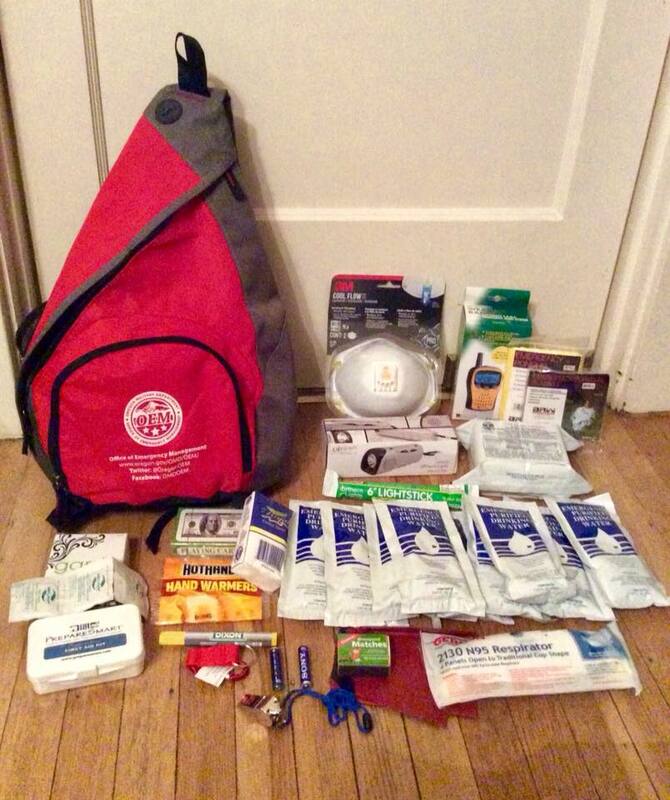 Share a personal story – Why is preparedness important to you? Were you involved in a previous disaster? What inspired you to join NET? Recognize that getting prepared can be emotionally and financially overwhelming. Remind them that it’s a process and they don’t have to do everything at once. Recommend starting with ONE easy, achievable thing like water storage (1 gallon per person per day). If cost is a concern, remind them that they probably already have many items in their home or garage. Share tips for finding supplies at a discount or making your own. We’re also working on a quick reference cheat sheet for volunteers that includes, helpful links, a map of NET teams, NET team lead contact info, a list of places to get water jugs and other supplies, and talking points. The Arbor Lodge / Kenton Neighborhood Emergency Team recently staffed a booth at the Kenton Street Fair. 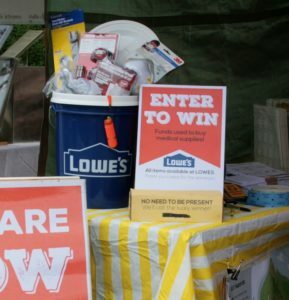 Our neighborhood Lowes in Hayden Island donated a bucket full of preparedness supplies, which we used as a raffle prize. 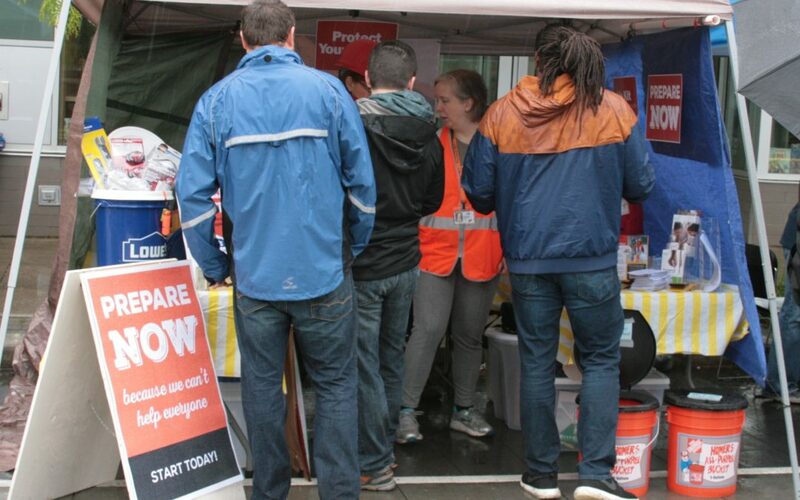 It was a dreary, rainy day in mid-May, but our booth had a steady stream of visitors. At $1 a pop, we raised $60 for our team, which we’ll use for medical supplies to put in our team cache. We All Win: The NET Program got attention, lives may be saved by those medical supplies, and Lowes got free advertising at our event. They also showed us that they care about the safety and wellbeing of our community. Business partnership is something all NET and CERT teams should be thinking about. While the City of Portland funds the coordination of the NET Program, we are, in the end, non-funded neighborhood groups with a critical need for supplies and other support. There are so many ways a business can help. Depending on the type of business, size, and structure, some ways will make more sense than other ways. When talking to businesses, it’s probably best just to focus on a few of these ideas instead of overwhelming them with the whole list. Hardware stores, grocery stores, camping supply stores, army supply stores, kitchen supply stores… heck, almost any kind of store can make an in-kind donation (aka supplies). Recently the St. Johns NET Team Lead received donations from St. Johns ACE Hardware, which they raffled off at the St. Johns Bizarre. 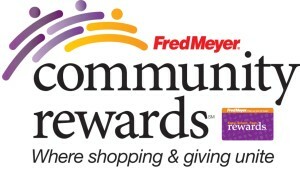 In addition to one-time, lump-sum contributions, there are also models of businesses donating cash on an ongoing basis via rewards programs. 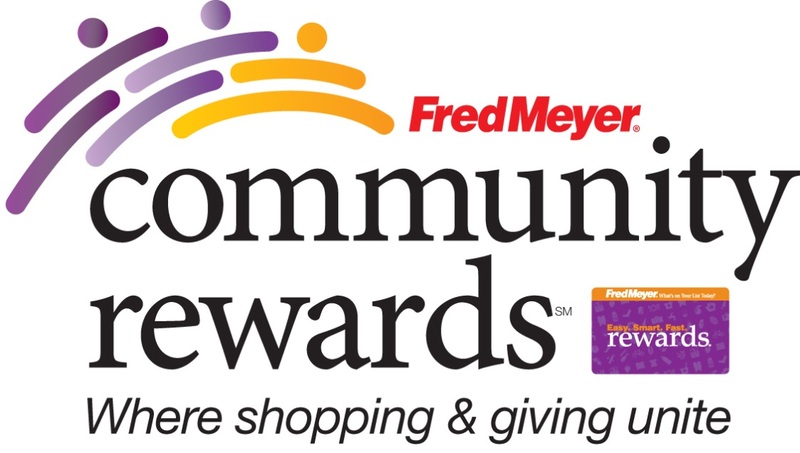 Fred Meyer’s Community Rewards Program allows shoppers to connect their Rewards Card to a NET team, which will in turn receive cash donations each month based on how much shoppers spent. Did you know? Donations are tax deductible. We are a 501c3 organization. NETs are making plans for team mobilization in the event of an earthquake. Ideally, they will use a field or other open space as a staging area for their operations. But if it’s cold and rainy out, they could really use a large indoor meeting space. Businesses with a large, modern building could allow NETs to use it as a staging area or shelter after an earthquake. Identifying these types of buildings ahead of time will help immensely. My favorite neighborhood restaurant, New American, has allowed the Overlook NET to hold team meetings in their space. Delicious local food and earthquake preparedness, together at last! Many NETs are assembling supply caches, and they need somewhere to store those materials. A shed, a warehouse, a shipping container – you name it. Our team is talking to our local Lowes store manager about the possibility of having a NET-themed display at the end of an aisle. But it could be as simple as a flyer hung on the door of neighborhood stores. New Seasons Market takes safety and community seriously. That’s why they’re encouraging employees to ready themselves for an earthquake. They’re also working to get a few employees from each of their stores to complete NET training and get involved with local teams. Just imagine if all of our grocers did the same! Good for the business, good for the community. Businesses can help our efforts by helping themselves. They need to educate and train employees, consider hazards in their work space, and plan for continuity of business. The NET Program is working on a way to provide support in this planning. In the meantime, resources such as Open for Business and Prepare My Business have helpful handouts and other resources. You may be thinking: “I don’t know how to solicit donations!” In the case of Lowes donating a bucket full of supplies, it was as easy as one of our team members walking in the store and talking to a manager about the work we do. You’d be surprised how willing most businesses are to contribute. Sometimes all you have to do is ask! You may also be thinking: “I don’t know anything about business preparedness!” South Burlingame NET has prepared a terrific form that you can use to open a conversation with a neighborhood business. You don’t have to be a NET member and you don’t have to be a preparedness expert to talk to neighborhood businesses. Just tell them that you’re a concerned community member and that you can put them in touch with the Team Leader for your neighborhood’s team. They can also complete our online donation form or contact form, which will be routed to the appropriate person.